The update fixes a pair of relatively high-profile issues that were introduced in iOS 12. The first fix is to charging behavior. In rare occasions, an iPhone or iPad upgraded to iOS 12 didn't start charging when connected to a Lightning cable. The update also fixes a Wi-Fi connection issue, where the iPhone XS family of devices would re-connect to a mixed network on the slower 2.4 GHz band, even if a faster 5 GHz connection was available. Other fixes include subtitling on video appearing properly, the restoration of the original ". ?123" key on the iPad keyboard, and a Bluetooth availability issue. Both the Wi-Fi and charging issue fixes are included in the iOS 12.1 beta. 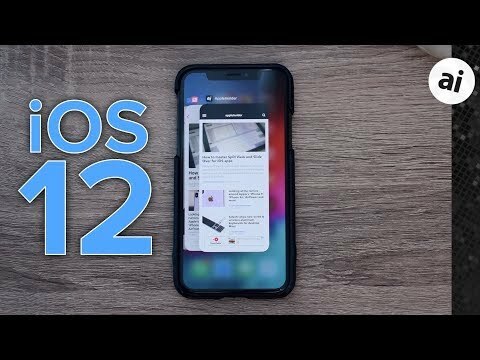 After months of beta testing, iOS 12 arrived on Sept. 17. The new OS features better performance for older devices, Augmented Reality and ARKit 2, new life balance tools, and tweaks to Siri, Photos and Apple News. It runs on devices dating back to the iPhone 5s. Update: found it searching again. Not available yet. I have had Wi-Fi drops on the iPhone X after upgrading to iOS 12 so hopefully that will be fixed and not just isolated to the new iPhones. The restoration of the ?123 key on the iPad is a huge fix! Swapping it with the emoji key was a dumb move. But the update does not show up on my iPhone X, iPad Pro (9.7) or older iPad Air 2. Eventually it will show up, but not available just yet. But it does show up in iTunes when I plug in and 'check for update'. Now it is showing up as an OTA update. What’s the app above the apple news app in the keynote pic? Only 14 days until the first point release of “the most beta tested iOS yet”. Better than last year’s 10 days I guess. And happy to have my iPad keyboard fixed. To all: we aren't like other venues and write that a release is "coming today." If we can't see the update as live ourselves, we don't take the post live. So, comments like "not available yet" aren't really that helpful, nor necessary. We are aware that it takes time to disseminate across Apple's CDN. Does anyone know if this update will fix CarPlay disconnecting from almost every CarPlay system? FWIW, I actually prefer a "coming today" post, perhaps including a note that all users won't be able to see it immediately to assuage the people hitting "check for update" repeatedly. Having the news sooner is more helpful than knowing when AI can see the update, because as you point out, it still doesn't tell me when *I* will be able see it. As a new XS owner I’m hoping this solves more problems than those listed. For one one I find this version of iOS to be dry glitchy. I know that is I’ll defined but in many cases this is seen in the web browser. Another glitch that seems to be far more produceable, is E-Mail not connecting over WiFi if the cell network isn’t reachable. At least not reliably. The place I work is like a bunker in some ways with all cell phones loosing connectivity in certain parts of the building. However I have WiFi but no E-Mail (at least most of the time). So far this cell phone has been pretty impressive and a huge leap from iPhone 4. There is just more oddness than I expected. I haven't had any issues with CarPlay yet. In another forum I post in, people are complaining about the same thing. The odd thing is the users who are complaining about constant disconnects, they have the same year and make as I do. I don't know if it's an app available outside of Apple or devs. Craig Federighi used it when talking about improved performance of iOS 12 on old and new Apple hardware. This must not affect every iPad or all models. I have an iPad 6th generation 32GB Wi-Fi + Cellular running 12.0 and my keyboard is "normal". Thought i had a bad cable when i went to charge my phone. cable 1 didn’t work and neither did number 2. Thanks for the post, i really thought i had a connector problem after the cables didn’t work. I see where you're coming from, but the problem with the "coming today" posts based on the data sources that we all use for it, is that they're wrong about 30% of the time. There’s still a problem with the XS charging from a Belkin dual iPhone & iWatch charging stand. Looks like this may be fixed by the next iOS release - post iOS 12.0.1 (currently in beta). If you're referring to the Powerhouse or Valet, Belkin says that they're not compatible with the iPhone XS family, or the iPhone XR. I have the Belkin Valet and running 12.1 beta on my XS Max - the valet is working fine. Belkin may remove the disclosure once 12.1 is out to the public. I haven't had that experience with BMW. CarPlay is fine, including its wireless connection.